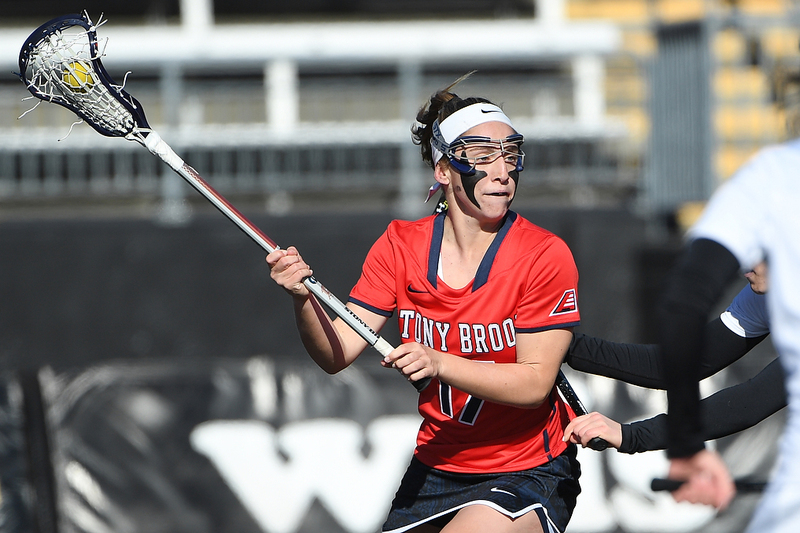 Capping off an already historic 2017, Stony Brook Women’s Lacrosse senior attacker Kylie Ohlmiller was selected as the first overall draft pick in the United Women’s Lacrosse League 2018 College Draft by the Boston Storm. Ohlmiller was one of seven players representing the Seawolves, who were the most represented program out of nearly 30 different colleges. She had a record-breaking 2017 season, stepping up for the team after redshirt-senior attacker Courtney Murphy suffered a season-ending ACL injury just five games into the 2016-17 campaign. Ohlmiller set the NCAA Division I single-season points record with 164 points, surpassing the previous record set in 2001 by Maryland attacker Jen Adams by 15 points. She scored at least five points in all but her first game, including a season-high 12 points against Bryant in the second game of the season. Ohlmiller also set the new NCAA Division I single-season assists record with 86, topping Hannah Nielsen of Northwestern’s 83 assists in 2009. She has led the team in assists for the past three years. The attacker is the first player in program history to have over 70 goals and assists in a single season. Ohlmiller’s performance in the 2017 season resulted in her being named the first women’s lacrosse finalist in Stony Brook and America East history for the prestigious Tewaaraton Award, which honors the top male and female college lacrosse player in the United States. Though she did not take home the Tewaaraton, she was awarded Division I Attacker of the Year by the Intercollegiate Women’s Lacrosse Coaches Association and ILWomen. Other players that were drafted include Murphy, redshirt-senior defensive back Brooke Gubitosi, senior midfielder Samantha DiSalvo, senior defensive back Carolyn Carrera, senior midfielder Tiffany Zullo and senior midfielder Emma Schait, who was the final pick of the UWLX draft. Neither head coach Joe Spallina or Ohlmiller could be reached before publication.